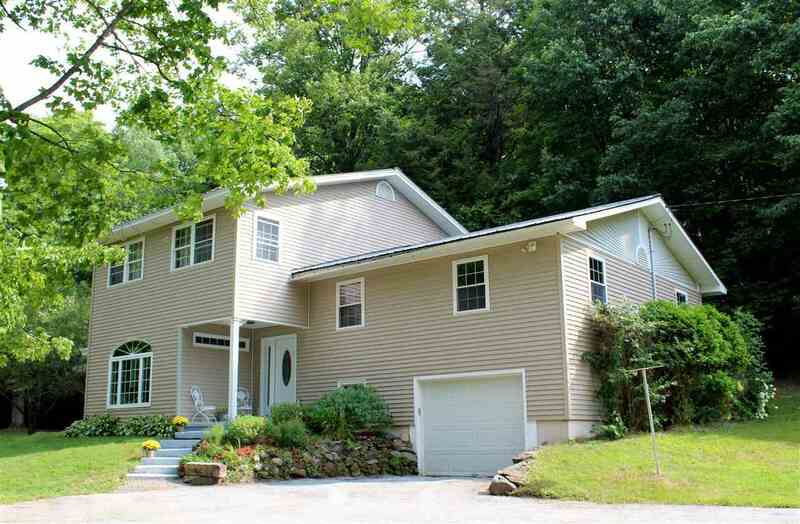 Remarkable 4-bedroom home, only 10 mins to Exit 19! With a private welcoming entrance that leads past the beautiful pond, stone wall, and mature landscaping you will make your way around the circular drive and look up to this generous house. Enter in to the large living area with over-sized window allowing for lots of natural sunlight and enjoy the wood fireplace with granite tile. The maple kitchen that overlooks the dining space includes ample storage with its curved island, pull out cutting board, concealed bread drawer, and walk-in pantry. Stunning sunroom would also make a perfect office or rec room with its own slider to private patio, custom built-in shelving, and vaulted ceilings. The 2nd floor hosts 3 tastefully decorated bedrooms and full bath. The upper level displays a massive master suite with vaulted ceilings, laundry chute, and amazing walk-in cedar closet with antique "ship wardrobe". The master bath does not disappoint with its custom arch surround over the tiled whirlpool tub, elegant, granite double vanity and its mosaic tile inlay. Additional exercise room and utility 1/2 bath/ laundry room are in the lower level. Oh and a little cherry on top..... grapevines!!! MUST SEE TO APPRECIATE!